Huntley celebrates its championship Saturday at Autumnfest hosted by Glenbard East. Taylor Jakubowski couldn’t explain it. Huntley looked dead in the water Saturday in Game 1 of the championship match against Benet at Autumnfest hosted by Glenbard East. A kill by Benet’s 5-11 senior outside hitter Valetina Tabares gave the Redwings a 22-15 lead and prompted a Huntley timeout. But a funny thing happened after the brief break. The Red Raiders were suddenly unstoppable, going on an 8-1 run to tie the set at 23-23. The game remained tied at 24-24 and 25-25, but a kill by Huntley’s Loren Alberts and an ace from Arianna Torres capped the improbable comeback. Huntley (30-3) carried that momentum into Game 2 — a set which featured eight ties – and aided by a controversial net violation against Benet with the Red Raiders nursing a 23-22 lead, closed out the Redwings 27-25, 25-23 to claim the Autumnfest title. “That momentum from Game 1 really helped,” said Huntley coach Karen Naymola. “It helped our confidence. I think we were playing a little timid in Game 1. We tipped more in that game than we did the whole tournament. The confidence gained from its fifth-place finish at the ASICS Challenge continues to produce win after win for the Red Raiders. 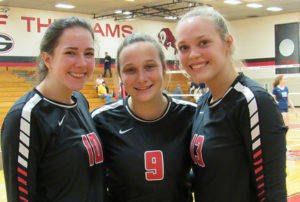 Five-foot-11 senior outside hitter Julia Johnson led Huntley with 12 kills, Alberts added 9 kills, Emma Konie had 6 kills, Sarah Zayas dug 14 balls and Jakubowski was all over the floor to the tune of 13 digs and 28 assists. 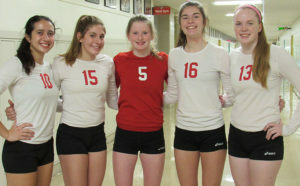 Benet (28-5) got 7 kills from 5-10 sophomore outside hitter Kyla Kenney, 6 kills and 2 blocks from Tabares, 3 kills from 6-foot sophomore Rachel Muisenga, 11 digs from 5-5 junior libero Hattie Monson and 3 kills, 2 blocks and 19 assists from Ally Van Eekeren. “They played a lot better than we did in just about every aspect,” said Benet coach Brad Baker. “We’ve seen clean volleyball, but this has just been a battle with ourselves all week. We’re just trying to scrape out wins. I don’t know if it’s tired legs, tired feet. 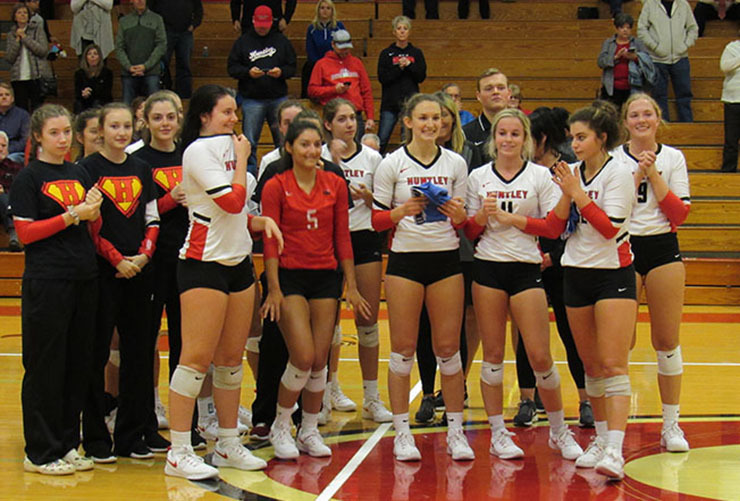 Benet reached the championship match following an emotion-filled 25-21, 19-25, 25-20 win over host Glenbard East (26-7), which advanced to the Gold division of its own tournament for the first time in the 29-year history of Autumnfest. “It felt amazing to get into the Gold,” said Glenbard East’s 6-foot Ball State-bound outside hitter Allison Hamaker. “The coach (Marci Maier) told us on Thursday that no Glenbard East team has done it before. Perhaps a bit drained by the semifinal loss, Glenbard East fell to Mother McAuley 25-17, 25-15 in the third-place match. “Sometimes when you play such an emotional game like they did it takes a lot out of you, and I think they might have been a little emotionally drained, which helped us a little bit,” said Mother McAuley coach Jen DeJarld. DeJarld added that her team (21-13), which at times has four sophomores on the floor, is final finding its rhythm. Joliet Catholic (21-12) reached 20 wins for the 17th time in the past 18 seasons under coach Chris Scheibe, winning the Silver division with a 25-13, 25-22 victory over Downers Grove North. It was the Angels’ ninth win in their last 10 games. Elsewhere, Barrington (23-11) made it a night to celebrate in the Jakubowski household by defeating Crystal Lake South 25-13, 22-25, 25-21 to win the Bronze division. Barrington is coached by Taylor Jakubowski’s mother, Michelle Jakubowski.